A diagnosis of a life threatening food allergy is a life-changing experience for individuals and their families. While living with food allergies requires always being vigilant, having a game plan helps make it manageable. There are many excellent national and in some cases local resources to guide families living with food allergies. 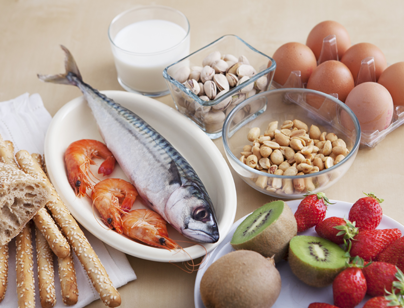 FARE (Food Allergy Research & Education) is one of the most prominent national groups. They have a very useful “Food Allergy Field Guide” that is geared to families newly diagnosed with food allergy and can be downloaded in PDF format. Their website (www.foodallergy.org) has a lot of resources. Locally, the Asthma and Allergy Foundation of America- St. Louis Chapter (AAFA-STL) is a fantastic organization. While they are geared a little more toward asthma, AAFA-STL holds Food Allergy 101 meetings throughout the year and has other resources. ALWAYS have access to epinephrine. Lack of access or delayed administration when having a serious reaction are more likely to lead to poor outcomes. ALWAYS read labels. If a food is not labeled, and you do not know who made it, then it is best to avoid it. Communicate effectively with friends, family, schools, and caregivers regarding the food allergy. Advocating for yourself or your family member is essential. Traveling and eating out can present their own challenges. A recent New York Times article discussed the difficulties individuals with food allergies may have when traveling by plane. Allergy Eats is a good resource to check out when it comes to dining options. It is important to remember that some food allergies may be outgrown, especially those to cow’s milk (dairy), eggs, wheat, and soy. Peanut, tree nut, finned fish, and shellfish allergies are less likely to be outgrown, but some individuals can still outgrow these. Therefore, regular follow up with your allergist is important. There are also new exciting treatment options currently available or on the horizon. Studies with the peanut and milk patches have been very promising. Oral immunotherapy (OIT) for foods is also an option for some individuals – but not for everyone. Our practice offers OIT with the first goal being risk reduction or significantly decreasing the risk that an accidental exposure will lead to a life threatening reaction or anaphylaxis.